They look terrible, don’t they? Frozen vegetables, taken right out of the package and dumped into a non-stick pan – which can’t be heated hot enough to do a proper Asian stir-fry anyway. Frozen vegetables, still clumped together by ice, with steam rising off them. By the time the cooking’s done, they’ll be soggy and tough and stringy… and they’ll taste like a freezer. Studies – oh, those crazy studies – seem to conclude that, in general, frozen vegetables are as nutritious as fresh. But really… can you make them taste decent? 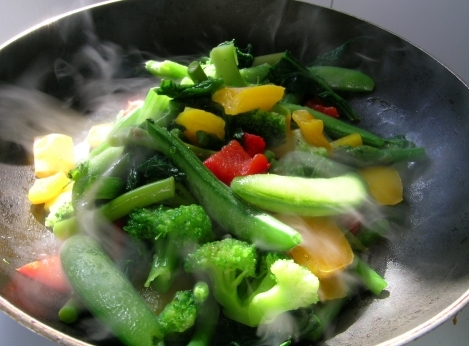 I’ve found that some frozen vegetables just don’t do it for me… like those stir-fry mixes. They include things – like snow peas and peppers and onions – that don’t seem to freeze well. And putting them straight from the freezer into a pan will turn them into strange fibrous mush, like some kind of alien first-course. Defrosting them means you must dry them thoroughly before stir-frying… and even then, they’re no screaming heck. As for using frozen veg successfully, I’ve got friends who’ve had good luck using frozen okra and spinach, for some applications. I stick to corn, peas, and the dreaded Frozen Mixed Vegetables – beans, corn, peas and carrots – for which I have an unnatural weakness. These things can be rinsed in warm water until they lose that freezery flavour, and then cooked in fresh water before being served as sides or added to soups and stews. Treated this way, I find they taste like they should – and they come out with an acceptable texture that doesn’t make me wonder what in heaven’s name I’m chewing. What veg do you eat from frozen? Or are you a fresh-or-nothing kind of girl or guy? This entry was posted on January 30, 2013 by thinkreadcook and tagged cooking, frozen, nutrition, vegetables.